Every R running for the nomination for President will use the term. Chris Christie brags that he is the only one among the R herd who has a proposal addressing the problem. For Christ’s sake, Hillary and other Ds fall into the trap as well. She has got to stop. We have to stop. Singling out social programs for vulnerable populations as “entitlements” — said as the commentator shakes his/her head at those greedy “entitlees” who risk the treasure and the future of the nation–is wrong, and it is damaging. The definition of entitlement is simple. It refers to something to which someone has a right by law or regulation, just like Wiki says. An entitlement is a government program guaranteeing access to some benefit by members of a specific group and based on established rights or by legislation. The term may also reflect a pejorative connotation, as in a “sense of entitlement“. So, what fits in that category? Let me see here. Having dinner with Charlize Theron or Jake Gyllennhaal. Okay, I threw that last one in to keep you awake. 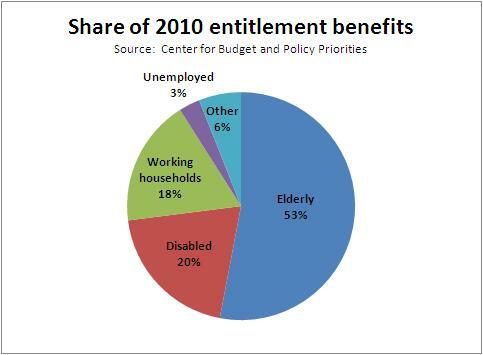 But, all the rest of the things mentioned are entitlements. We need to remember that entitlements are what governments “do.” They split up the nation’s financial pie into smaller and larger pieces by creating entitlements to this piece or that. Saying “government entitlement program” is redundant. It is a what grammarians, our language police, call a pleonasm, like saying advance reservations, armed gunman, filled to capacity, or free gift. If something is not free, then it is not a gift, and so on. Saying Medicare and Social Security are “government programs” is all you need to say. Unless you want to stigmatize those who receive benefits from that program that is all you need to say. Yes, we say armed gunman all the time, but it is dumb. We also say government entitlement programs all the time. Even government bureaucrats do it. I recently read a report from a federal agency where they said some called Social Security and Medicare entitlement programs because if people met the program requirements, then they were “entitled” to the benefit. If I own a Lear Jet, then I am “entitled” to use the IRS accelerated depreciation schedule. The word entitlement tells one nothing. It is a worthless word that imparts no information. So, why is it used? The term has a somewhat tortured history (http://languagelog.ldc.upenn.edu/nll/?p=4240), but I know how it is used today. The current connotation implies that someone didn’t earn something or qualify for something. Instead, they get this benefit because they have a right to this entitlement. As in the Wiki definition above, we subconsciously connect the word itself with an objectionable attitude– a sense of entitlement. Note that Wiki suggest you check out “narcissism” (not what anyone but a McTrump would consider a positive personality trait) for further insight. Nonetheless, we will continue to hear this deceptive term in policy discourse. I’m afraid it is too deeply embedded in our national political consciousness. The data indicate that without Social Security, a program to which they contributed throughout their working lives, 44 percent of the elderly would have incomes below the poverty line. (See http://www.mybudget360.com/social-security-poverty-ssa-main-source-income/). Social Security and Medicare are crucial programs, but they along with Medicaid get dissed by being held out as “entitlements.” They are no more, or less, entitlements than any other government benefit, including tax expenditures for the interest paid on a debt for a second home or the rules concerning bankruptcy. It is time that we forced this meaningless word, entitlement, out of common usage. We must focus on what programs do for whom. We cannot allow commentators and politicians to continue relegating a group of crucially important social programs to some lower status by labeling them with a meaningless term that devalues them and those who vulnerable Americans, many of them poor or in poor health, who benefit from them.